Dress up and top off any outfit with a lightweight, shimmery easy fit jacket. 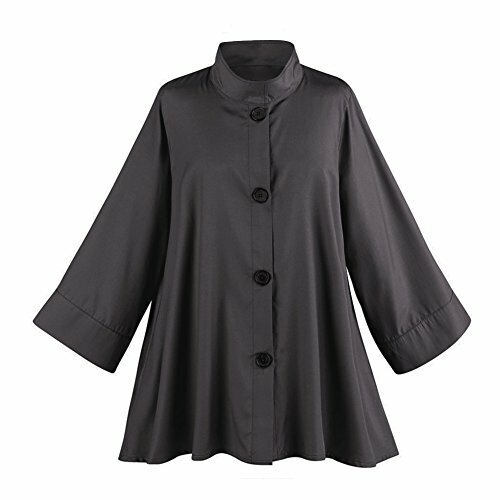 Simply designed to feature the glorious fabric, it has an over-sized banded collar, banded -length sleeves, side seam pockets, flared hem, and full button front. 100% polyester. Hangs 29". Sizes S/M(4-10), L/XL(12-16), XXL(18-22). Machine wash. Imported. Specify: Eggplant, Emerald, Silver, Teal, Lavender, Red, Black. ADD SOME SHIMMER TO YOUR LOOK - This easy-fit swing jacket catches the light as you move, giving your everyday outfits some colorful flair. WEAR WITH SKINNY JEANS OR LEGGINGS - Long, tapered fit looks great over your favorite fashionable legwear. Hangs 29". SIDESEAM POCKETS - Perfect for holding your phone, wallet, and other small essentials. FASHIONABLE 3/4-LENGTH SLEEVES - Keeps you cool in warm weather, and lets you show off your wrist and bracelets. FULL BUTTON FRONT - Wear it open to present a T-shirt or blouse, or closed for a cute, swing-coat look.